Former Russian Deputy Culture Minister to stay in detention until January 17 | Russian Legal Information Agency (RAPSI). MOSCOW, October 15 (RAPSI) – The Basmanny District Court of Moscow has extended detention of the previously convicted former Deputy Culture Minister Grigory Pirumov on new charges, until January 17, the press-service of the court has told RAPSI. Detention of another defendant in the case, head of Rospan company Nikita Kolesnikov, was extended until January 16. Both defendants are charged with embezzlement committed by an organized criminal group or on an especially large scale. 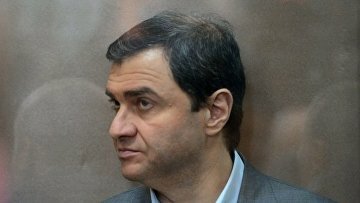 Investigators believe that Pirumov, Kolesnikov and ex-director of the Culture Ministry’s department of property management and investment policy Boris Mazo, who was put on an international wanted list, as well as other unidentified persons embezzled 450 million rubles ($6.8 million) by signing of contract for construction of the Hermitage Museum‘s facilities without intending to complete the contract. In October 2017, the Dorogomilovsky District Court of Moscow sentenced Pirumov to 1.5 years in a penal colony. The court took into consideration the time Pirumov spent in detention and freed him in the courtroom. On December 19, the Moscow City Court toughened punishment for Pirumov. The court imposed a 1-million-ruble fine ($17,000) on ex-official and deprived him of the second-class medal of the Order of Merit for the Motherland. However, prosecutors again filed an appeal against Pirumov’s sentence demanding a 5-year prison term for him. The appeal has been set for May 25. As part of the case for other defendants including Mazo, received prison sentence from 1 to 1.5 years and were released as Pirumov. Three more defendants, BaltStroy manager Alexander Kochenov, businessman Andrey Kokushkin and ex-director of the State Center of Contemporary Art Mikhail Mindlin, received suspended sentence ranging from 1 year to 1 year and 5 months. Investigators claimed that between 2012 and 2016 the defendants embezzled over 160 million rubles allocated on restoration of the Novodevichy Convent in Moscow, Ivanovsky Convent in Moscow and other objects across Russia. In December 2016, Chairman of the Russian Government Dmitry Medvedev relieved Pirumov of his post.